The ergonomically designed handles provide better grip and durability. These super-efficient blades made of superior quality stainless steel can do better grinding of food ingredients as required- fine, medium or coarse. 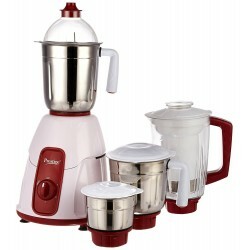 It comes with 4 varieties of stainless steel blades to perform different operations. 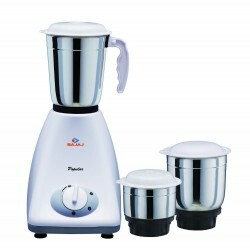 The jars are designed to perfection with superior quality stainless steel body with sparkling mirror finish. The dry jar and chutney jar is perfect for all your grinding and powdering needs such as dry masalas. The wet jar is suitable for lassi, Idli, Dosa batter etc. These jar grinds faster & finer, thus saving your time. The superior quality transparent juicer jar serves all your special juicing needs. The mixer grinder is designed with perfection. This appliance from the house of Prestige will surely blend with all modern kitchen décor. 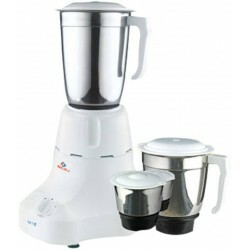 The mixer grinder comes with power packed 550 Watt motor for quick & effortless grinding of ingredients, thus saving time.